learnt that the president's aides returned to the drawing board to plot new line of action. To this end, they have made arrangement to choreograph a video clip of President Yar`adua on his sick bed at King Faisal Teaching Hospital and transmit it on Nigerian Television Authority on a date yet to be determined. However, some members of the cabinet are of the opinion that President Umaru Yar`adua must return and continue his treatment in Nigeria before the end of January. Since November 23rd 2009, Nigerians has sought to no avail the where about of their president. Nevertheless, a thick dark smoke was let into the rabbit hole on Monday, 11th January, when American Chronicle wrote “Nigerian President, His Excellency Umaru Yar`adua is dead according to authoritative sources at the King Faisal Specialist Hospital and Research Centre. He died on the 10th of December at 3.30pm at an Intensive Care Unit at the King Faisal Specialist Hospital and Research Center in Jeddah Saudi-Arabia. Sources at the Hospital say that the First lady wants to keep the news secret for the next few days for personal reasons. At the time of his death he was surrounded by his wife, Turai and a childhood friend, Nigerian Member of Parliament”. Asked about the authenticity of his story, Mr. Hodderway the writer, said, “This is a very true story. Medical staffs at the hospital are being paid huge sums to keep mute. Turai and others are trying to find ways to find a worthy successor who will protect Yar`adua's interests. At the end of the day, the joke is on you Nigerians. The government plays you people for fools. Unfortunately. The article had a mistake. He died on the 10th of January 2010 not on 10th December”. 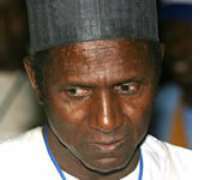 But Tanimu Yakubu, Chief Economic Adviser to President Yar`adua, argued against this position: He told Huhuonline.com, “You are making me to break my silence on not responding again to recurring death wishes for President Umar Musa Yar'adua.I confirm that the story in the hyper link you referred me to is yet another death wish for President Umar Musa Yar'adua. President Umar Musa Yar'adua is alive. Watch out for a proof shortly”. Continuing, he said, "Mr. President's friend in the National Assembly is Hon. Member of the Federal House of Representatives is Mallam Shehu Inuwa Imam representing Faskari Federal Constituency in Katsina State. This gentleman was in Nigeria on the day he was wished to have witnessed the President's death! Once again, I confirm that President Umar Musa Yar'adua is alive, feeling much better, mentally alert and home bound very soon by the grace of the Almighty God". Hour passed, and we did not receive the proof which was promised to come shortly, a reminder was sent to the messenger, his response was “Please listen to Subject wire services Tuesday at 5am and 5.30am Nigerian time respectively”. As promised, BBC birthed, but their offspring, thus far has raised more questions than answers. Many Nigerians do not believe that the spokesperson was President Umaru Yar`dua. So the question still is where is our president?